After spending 4 very fun days in Paris, my daughter and I took the TGV (high speed train) from Paris to Antibes. I love to travel by train; unlike the stress of airline travel, we had a very relaxing 5 hour trip in 1st class reading, talking and watching the scenery roll by. Our destination was Antibes, our home base for exploring the Côte d’Azur. 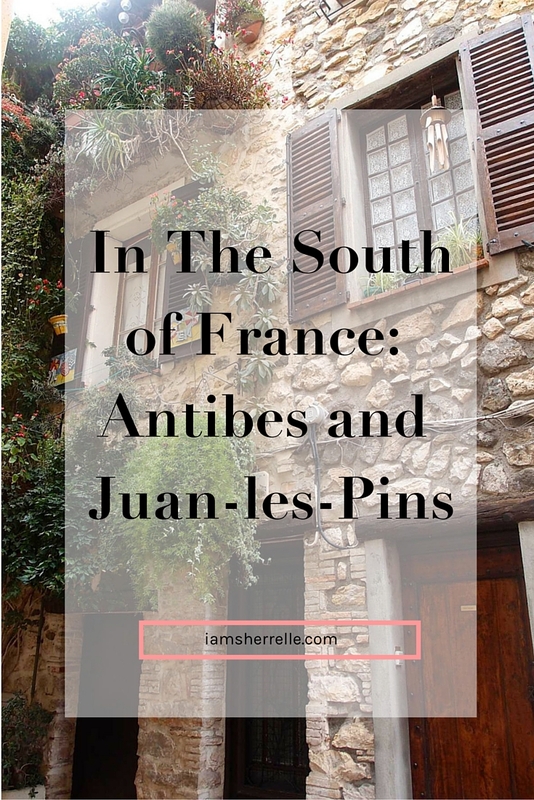 We had 4 days to see several towns and we started with 2 charming towns in the South of France: Antibes and Juan-les-Pins. I didn’t have a train schedule or map, so I didn’t quite know where the train was going to stop – and all the announcements on the train were being made in French. I managed to listen really hard and draw upon my elementary French to figure out our stop. But upon disembarking we had a new dilemma – I didn’t know how to get to the hotel. I thought that there would be taxis outside the train station like in Paris, but this was a very small train station and absolutely no one was outside but a few construction workers – who only spoke French. So I spoke French and somehow managed to understand their directions enough for us to walk the mile to our hotel, pulling our luggage all the way. We finally made it to our home for the next four days, Hotel La Place. There was no elevator (I had quite a workout carrying our luggage up 2 full flights of stairs) and our room was very small, but the hotel was very lovely and the staff was nice. The location was great, right outside Old Antibes and right by the sea. We could walk to many things and the bus station was right outside. The first day in Antibes was unseasonably cold and windy, but we strolled Promenade Amiral-de-Grasse anyway and took in breathe-taking ocean views. Thankfully the seawall prevented us from being blown into the sea – it was that windy! We wandered down the main street in Old Antibes and into shops. 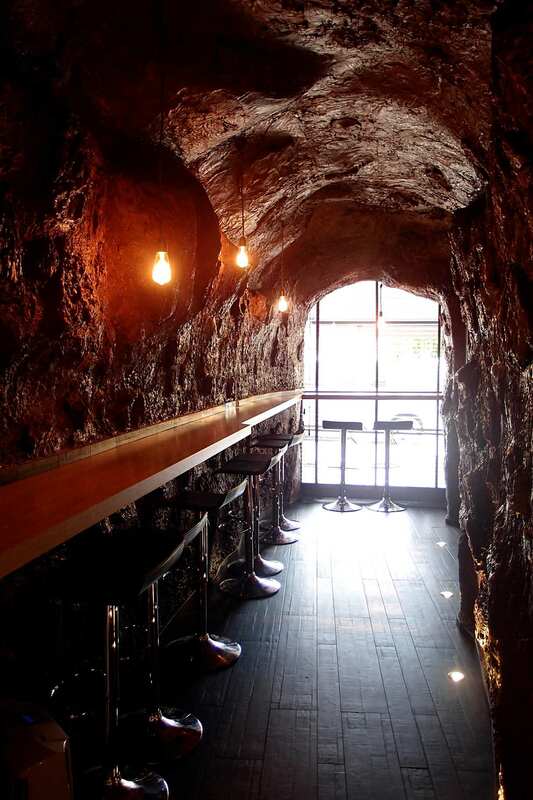 There is a chocolate shop that has a chocolate cave, complete with chocolate walls. Even though Old Antibes has plenty of tourist shops, the restaurants and people are very much local. Antibes has a very different feel than Paris, much slower, much more “everyday people” feeling; less people speak English so I really got to practice my French. Although we took day trips to other nearby towns in the Côte d’Azur, we spent part of each day in Antibes. By the end of our stay we felt very much a part of Antibes. 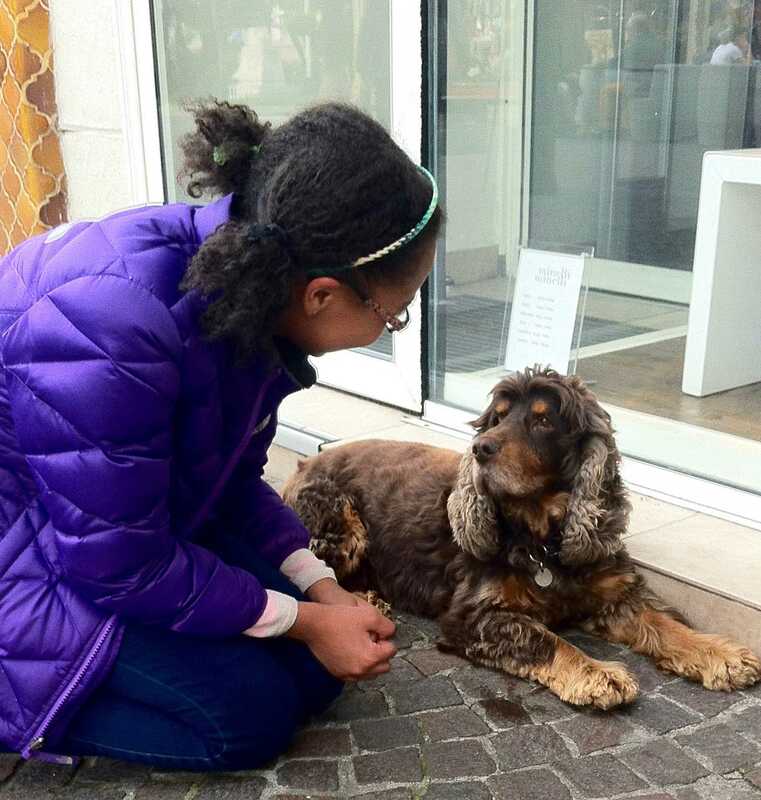 My daughter even met a friend, Roin the dog, who greeted her each morning as he sat outside his owner’s shop. 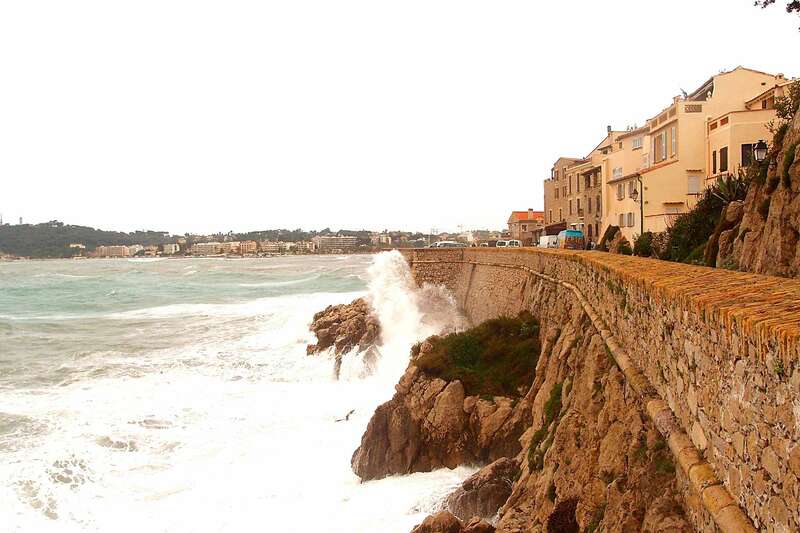 Antibes is small, but has many things to see and do. 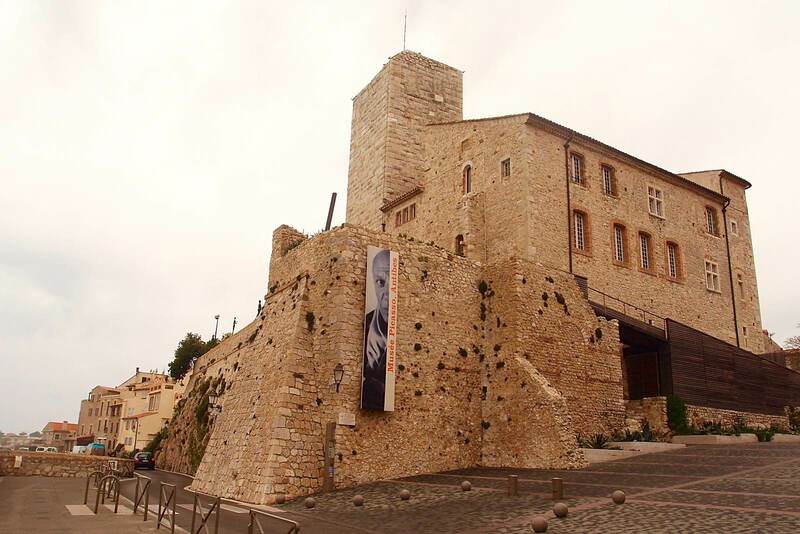 We toured Musée Picasso, a chateau belonging to the Grimaldi family, where Picasso spent several years painting. It’s right on the sea and not only has incredible artwork, but also incredible views of the ocean. It was too cool for us to actually get in the water, but there are several beaches in Antibes, La Gravette below the port, central plage du Ponteil and plage de la Salis towards the Cap. 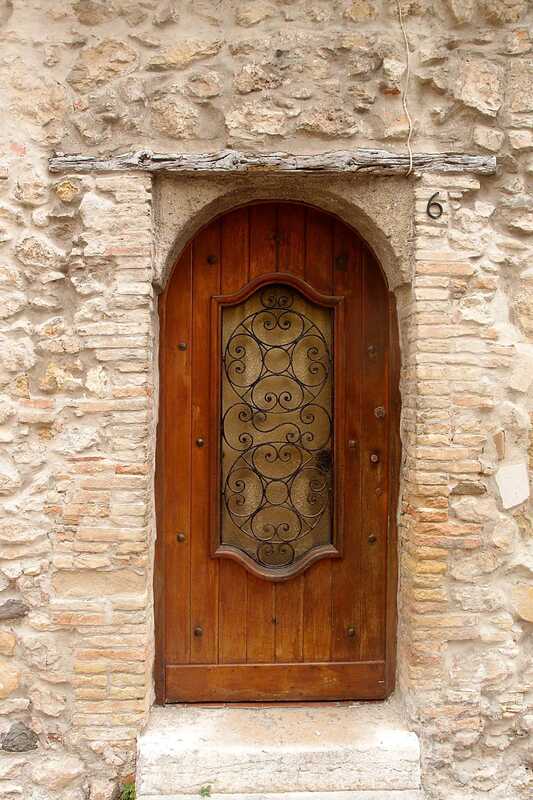 However to me one of best things to do in Antibes is just to simply enjoy the history and charm. Wandering down side streets and following the twists and turns of the tiny cobbled-stone streets was our favorite activity. Cute rue St-Esprit is postcard-worthy and the neighborhood of Commune Libre du Safranier is so picturesque with flower boxes in every window. I took several photos for my framed French Doors collection. The stores close from 12-2pm and then for the night at 7:30pm, even the grocery stores. Restaurants open around 7:30pm and many are closed on Wednesdays. There is a Monoprix (Target-like store) on Place du Général and a Carrefour (grocery store) on Ave Pasteur. There is also an organic grocery store in Old Town, near the playground. Get maps of Antibes at the tourism office, 11 place de Gaulle. There is an English bookstore off rue Aubernon, near the port. They have maps and books in English about Côte d’Azur (and just books). 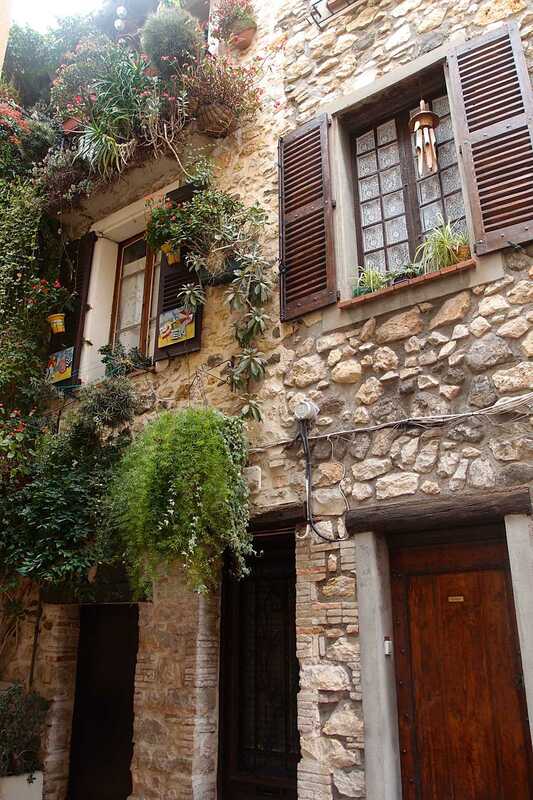 Definitely wander off the main street in Old Antibes, down side streets and alleys. From Antibes it’s a 20 minute walk to Juan-Les-Pins but you can also take the #1 bus. Antibes and Juan-les-Pins are sort of like sister cities, but have very different vibes. Antibes feels more low-key while Juan-les-Pins feels more like a party. We sat on the jetty and ate the snacks that we purchased from the grocery store, walked around the promenade, browsed the shops and had dinner on the boardwalk at L’upside Down Cafe. Visiting Juan-les-Pins was nostalgic for me because I had visited the very same beach many years ago, after I graduated from college. It was quite sentimental to now share that experience with my daughter. Walking back to our hotel in Antibes we walked a bit of the trail of artists that spans many miles in Côte d’Azur. In this photo you can see the alps that Monet painted on that very spot. If you erase the concrete development, the scene looks almost the same. There are several spots like this in Antibes and the art-lover in me thought that was pretty special. Antibes and Juan-les-Pins were so fun for us to explore, but our trip to Côte d’Azur was not over yet; come back next week to read about our most incredible day in Antibes – or better yet, sign-up to receive updates directly in your inbox. P.S. You may also like to read about my other trips to France. I love reading your adventure! It’s making me excited to visit (I’ll be there in a week!) . Hi Rebecca, I was there in the spring, early April. It was freezing the first day and then very lovely the rest of the time. This time of year should be very nice. 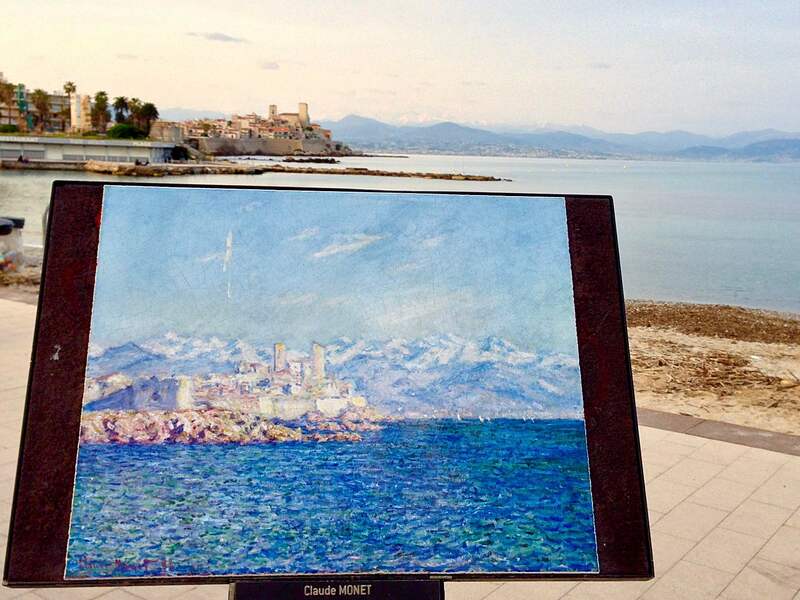 Did you read my post on the Cap d’Antibes trail? You must do that! I dream about that hike and can’t wait to go back! Have a great time!